120 guitars owned by Pink Floyd's guitarist, including ones he recorded and performed many of his most indelible recorded and performed solos on, are going to auction to raise money for charity. Highlights of the June 20 auction held by Christies in New York City will be the 1969 black Fender Strat heard on Dark Side of the Moon, Shine On You Crazy Diamond, Animals and The Wall. 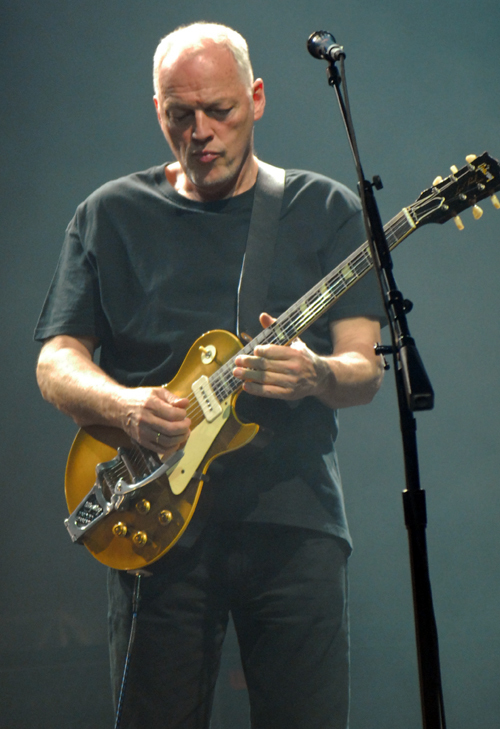 The guitar that produced Gilmour's searing solos on Money, Comfortably Numb is expected to sell for 100-150k. We'd anticipate it goes for considerably more. The 1955 Les Paul Gold Top he played on Another Brick In The Wall (Pt.2) is valued at 30-50k, and his 1954 white Fender Strat used on The Wall and frequently on stage will probably fetch $100,000 - $150,000.